Basra (Iraq) (AFP) – Protests in Iraq continued into their second week Monday following days of clashes that left eight people dead, with demonstrators rallying to put social problems in the spotlight. Iraqis already made their dissatisfaction with their leaders known through massive abstentions in May’s national elections, and now citizens are taking to the streets to demand they see benefits from the country’s vast oil reserves. “These oil fields belong to us, yet we get nothing,” said Hussein Ghazi, a 34-year-old protester in the port city of Basra. AFP / Haidar HAMDANI. 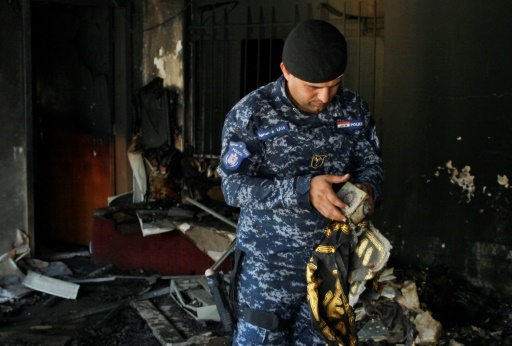 An Iraqi policeman holds a recovered holy Koran from the premises of the Islamic Dawa Party that was torched during protests in the central shrine city of Najaf on July 14, 2018. Following the US-led invasion of Iraq in 2003, the country’s new leaders and public servants reaped the benefits of public funds and natural resources, leaving citizens with only basic infrastructure, according to protesters. “We hear a lot of grand words, but we don’t see anything coming,” said Basra demonstrator Aqil Kazem, an unemployed 27-year-old. As demonstrations continued, Abadi on Sunday met with security and intelligence chiefs in Baghdad and warned them to be on alert “because terrorists want to exploit any event or dispute”. AFP / Haidar HAMDANI. 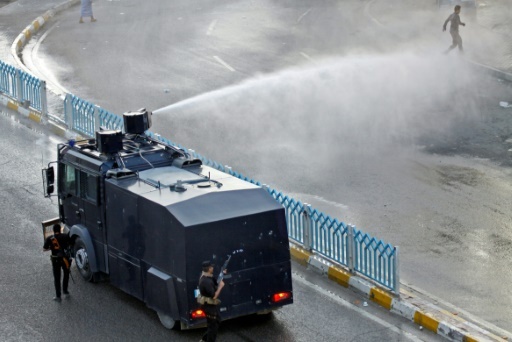 Demonstrators are sprayed with water cannon by the Iraqi security forces during protests in the central shrine city of Najaf on July 14, 2018. Despite the internet blackout, hundreds of protesters in Baghdad closed a highway on Sunday as they chanted slogans such as: “The people want to overthrow the regime”. The demonstrators have won the backing of Iraq’s top Shiite authority, Grand Ayatollah Ali al-Sistani, who has also called on them to refrain from violence. The latest rallies follow a 2015 protest movement against corruption and the absence of public services, led mainly by nationalist Shiite cleric Moqtada Sadr who won this year’s elections on an anti-graft ticket. Featured Photo: AFP / Haidar MOHAMMED ALI. A protest sign held during demonstrations in the southern city of Basra on July 15, 2018, reads “Basra’s oil belongs to Basra”.